The conditional logical operators (&&, ||) can short-circuit evaluation, based on the value of the left side of the expression. You can also think of the conditional logical operators as being equivalent to the ternary conditional operator. You can use either the logical operators (|, &) or the conditional logical operators (||, &&) when comparing two boolean values (or expressions). The difference between these operators, when used with boolean values, is that the conditional logical operators can short-circuit evaluation, avoiding evaluation of the right side of the expression if possible. When you use the shift operators on integer-based values, you effectively multiply a number by two when you do a left shift by one bit and divide a number by two when you do a right shift by one bit. In years past, you’d sometimes hear a recommendation that you should prefer using the shift operators over multiplicative operators because the shift operators were faster. With modern optimizing compilers, you should no longer worry about this level of optimization and performance. If you need to multiply a number by a power of two, you should express your intent by using the multiplicative operators. (E.g. “* 2” or “* 4”). The compiler will figure out that fastest way to accomplish this. You can use the ~ operator to do a bitwise NOT operation on an integer-based value. A NOT operation is applied to a single input bit, returning true if the input bit is false, or false if it is true. The NOT operator “flips” or “negates” the input bit. 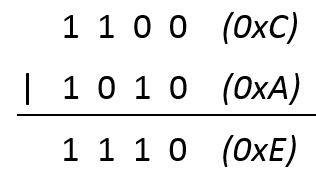 Here is a truth table showing the output value for the possible input values. You can use the ~ operator on an arbitrary integer value as shown below. The NOT operation will be applied to the integer value, one bit at a time. It may help to use hex notation in order to better understand how the NOT operation works on each bit. You can use the | operator to do a bitwise OR operation between two integer-based values. 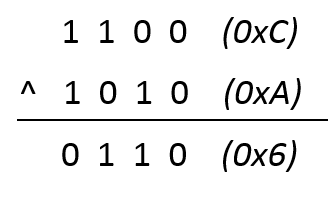 An OR operation is applied to two different bits, returning true if either one or both input bits are true. Here is a truth table showing the output value for all possible input combinations. You can use the | operator on two arbitrary integer values as shown below. The OR operation will be applied to the two integer values, one bit at a time. It may help to use hex notation in order to better understand how the OR operation works on each bit.